Libya parliament speaker Aguila Saleh. Eastern Libyan forces will pursue their advance on Tripoli, the head of the eastern parliament in the divided country said, despite international calls for a halt in the offensive. His comments follow an eastern air strike on a school, where eastern forces were confronted by forces allied to Prime Minister Fayez al-Serraj’s internationally recognised government. In a possible new front, the eastern Libya National Army (LNA) was readying a unit to move to Es Sider and Ras Lanuf oil ports, Libya’s biggest, anticipating an attack from an armed group allied to Serraj, eastern military officials said. “The force will strengthen protection of the ports,” one official said. Last week the European Union called on the LNA to stop its attacks, agreeing on a statement after France and Italy sparred over the conflict. The eastern parliament head said they would press an offensive launched under military commander Khalifa Haftar. 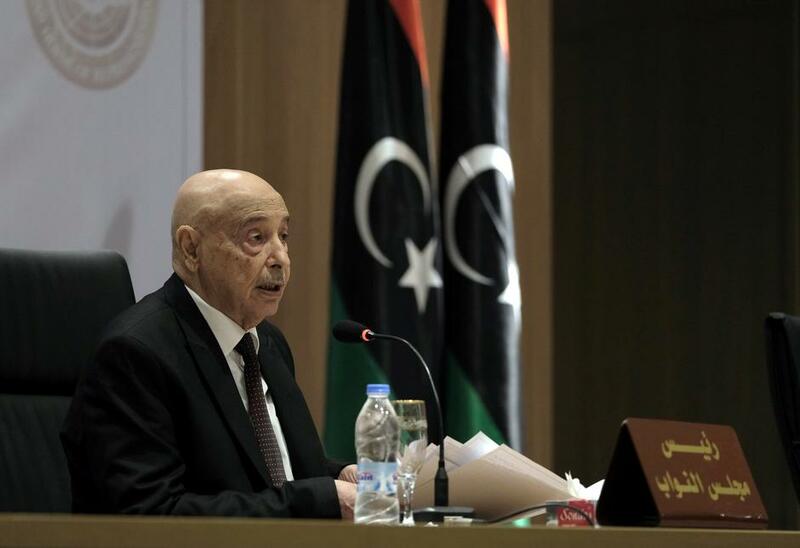 “We need to get rid of militias and terrorist groups,” Aguila Saleh, head of the House of Representatives allied to Haftar, said using a reference eastern officials make to describe forces allied to the Tripoli government, which relies on support from several armed groups. “We assure residents of Tripoli the campaign to liberate Tripoli will be limited and not violate any freedoms but restore security and fight terrorism,” Saleh told lawmakers in a session in Benghazi. For its part the Tripoli government will agree to a ceasefire only if the LNA troops return east, government spokesman Mohanad Younes told reporters. Forces loyal to al-Serraj’s government have so far kept the eastern offensive at bay. Fierce fighting has broken out around a disused former airport about 11km from the city centre. An eastern military source said an LNA warplane attacked a military camp in an eastern Tripoli suburb. In a separate strike the yard of a primary school was hit, a Reuters reporter at the scene said. A LNA official said the plane targeted a camp of Serraj’s forces. Saleh said the United Nations mission to Libya and Serraj’s government was controlled by armed groups and failed to expel them. He promised Libya would hold long-delayed elections after the Tripoli operation ends. Haftar’s offensive surprised the United Nations, which was planning a national conference on April 14 to prepare Libya for elections.